The 1920 Calgary Professional Baseball Club. Top row, L-R: Bill Hamilton, Chicken Hawkes, Seacap Christensen, Harvey Christensen, Joe Tobin, Carl Manda. 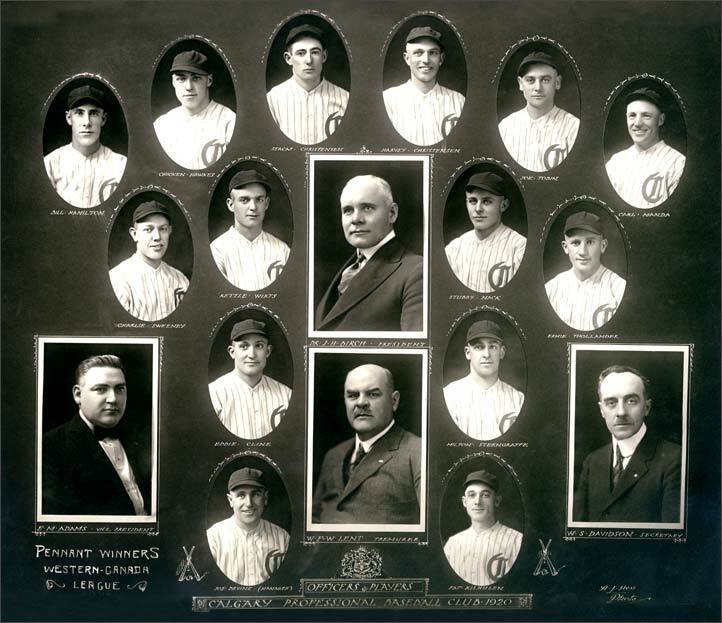 Second row, L-R: Charlie Sweeney, Kettle Wirts, Dr. J. H. Birch (president), Stubby Mack, Ernie Thollander. Third row, L-R: E. M. Adams (vice-president), Eddie Cline, W. F. W. Lent (treasurer), Milton Steengrafe, W. S. Davidson (secretary). Bottom row, L-R: Joe Devine (manager), Pat Kilmulen.